The Calais Folkestone Eurotunnel route connects France with England. 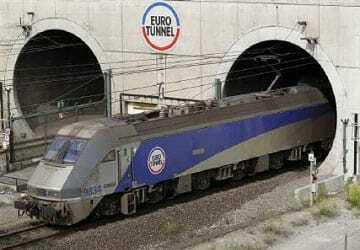 Currently there is just the 1 Eurotunnel company operating this Eurotunnel service, Eurotunnel. The crossing operates up to 55 times each day with sailing durations from around 35 minutes. Calais Folkestone sailing durations and frequency may vary from season to season so we’d advise doing a live check to get the most up to date information. Prices shown represent the average one way price paid by our customers. The most common booking on the Calais Folkestone route is a car and 2 passengers. The town and port of Folkestone is located on the south east coast of England, in the county of Kent, and lies on the English Channel coast. The town sits at the southern end of the North Downs , where they meet the sea, and unlike the white chalk cliffs at nearby Dover, the cliffs at Folkestone are of Greensand and Gault clay. The Pent Stream which cuts through the cliffs at Folkestone provided the original haven for fishing vessels and cross channel boats. Part of Folkestone also falls within the boundaries of the Kent Downs Area of Outstanding Natural Beauty and the nearby Brockhill Country Park, to the west of the town, has a lovely lake and footpaths and links to the Royal Military Canal at nearby Hythe. The town also has two important Battle of Britain landmarks. The first is the Kent Battle of Britain Museum which is the oldest Battle of Britain museum in the UK, and the second is the Battle of Britain Memorial at Capel-le-Ferne. The town's harbour is now mainly used by the town's fishing fleet and also by pleasure boats.